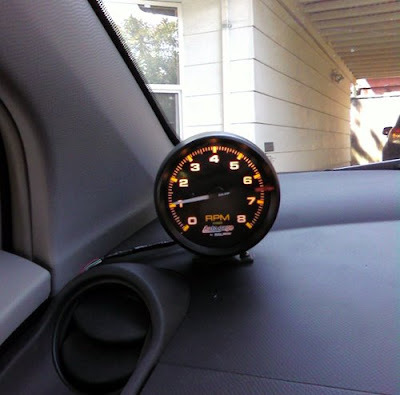 I finally got fed up with not having a tachometer in my 2007 Yaris, so I did something about it: I bought a Autometer Autogage 3-3/4" tachometer. It was my first automotive wiring attempt on anything other than a car stereo, and I'd say it went well (hey, it works!). There were four wires: I ran the green tach wire to a wire coming from the OBDII (used a splice clip); the ground wire to a ground by one of the interior kick panels; the red power wire to a 7.5 amp add-a-fuse; and the white illumination wire to a 10amp add-a-fuse. A little bit of electrical tape here, some shrink tube there, and presto: working tachometer. I was going to mount it to the dash with strong double-sided tape, but it didn't hold the tach's weight. I instead bolted it to the dash. Not my first choice, but it isn't going anywhere. The illumination is good, the tach works great, and it's not too big and not too small. I'd say it's just about perfect. I just need to hide the electrical-taped wires on the interior with one of those black plastic wire tube things (technically speaking) and it'll be finished off. The Yaris World DIY Tach Installation Instructions helped a lot! I did follow the DIY in Yarisworld, but I have one question for you. i recently bought the same tach off amazon. when you use 10-amp add-a-fuse on illumination, does it turn off when you turn the lights off? or does it stay on all the time? I was thinking about using dimmer wire from the stereo instead since mine is not using that anymore.